Now's the time: now you can browse thousands of back issue comics and find the variants you need for your collections. Our Flashback Sale ends 1/17! Dark Horse's Star Wars comics and graphic novels are among our most popular products at TFAW--are you promoting these titles to your readership?The smash hit of the year was definitely The Star Wars, an eight-part miniseries based on George Lucas' original screenplay for his sci-fi epic. Not only are issues #1-6 available, but there's a special #0 issue due in January featuring the never-before-seen comics sequences that were used in Dark Horse's pitch to George Lucas!Star Wars: Dawn of the Jedi - Force War is capturing a lot of attention, as longtime Star Wars comics creators John Ostrander and Jan Duursema pull out all the stops. Readers are also eagerly picking up the adventures of Ania Solo in Star Wars Legacy II: Prisoner of the Floating World, by Corinna Bechko and Gabriel Hardman. Another series that is attracting a lot of attention is Star Wars: Darth Vader and the Cry of Shadows, by Tim Siedell and Gabriel Guzman. During the Clone Wars, a single trooper--left for dead during battle--pledges allegiance to Darth Vader! 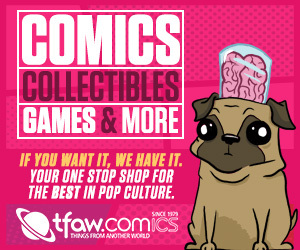 Make sure to check out our wide selection of Star Wars comics and more!